Have You Heard About Mates? If you have spent any time looking through EnMart catalog of sublimation blanks, you know we offer a wide variety of items on which you can sublimate. As a Rowmark distributor, we have access to the entire Rowmark line of products as well. Today, I wanted to take the opportunity to introduce you to the Mates line of Rowmark products. If you’ve not heard about Mates before, you may find that they’re just what you’ve been looking for to fill a niche in your business. EnMart offers white Mates stock in 12″ x 50 ft rolls and in 8 1/2 x 11 sheets. 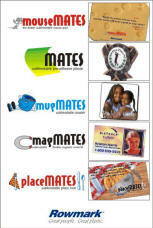 Mates is a flexible, pre-adhesive plastic material that can be used for electronic, appliance and computer labeling, recreational, automotive and aviation applications, signage, nameplates, awards, promotional products, packaging and point of purchase displays. It is a versatile material that can be cut into whatever size and shape you need it to be, but durable enough that your finished design will look great for a long, long time. Like almost any product that can be sublimated, Mates does have certain requirements that must be fulfilled to help ensure a great finished product. If you are just starting out with Mates, Rowmark offers some sublimation tips and techniques for the product that are sure to be helpful. If you do run into a problem sublimating your Mates product, Rowmark also provides troubleshooting tips for common issues. Mates can be attached to almost any substrate, so they’re a great option for the occasions when you want to sublimate an item that wouldn’t otherwise be suitable for sublimation. In addition to white, the Mates product is also available from Rowmark in clear, brushed sliver, brushed gold, brite gold and prism. White is the only color EnMart has in stock, but we can certainly order the other colors. If you would like Mates in a color other than white, just contact us and we’ll be glad to get those items in stock for you. Wow, what a cool product! I wonder how it would hold up for signage adhered direct to counter-tops. I’ve got so many ideas! I would guess it would be fine for use as signage on a countertop. It’s made to be used for nameplates and labels on computers and things like that. I don’t see why it wouldn’t work equally well as a signplate on a countertop.